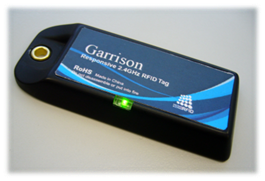 HK-RFID gladly adds another member to the active RFID tag series: GarrisonTM Responsive 2.4GHz active RFID tag - HKRAT-ZT02. LED light and tamperproof sensor is added on this tag. With its long reading range and great reliability, more complex and interactive applications in asset tracking, warehouse management, logistic and supply chain management are available. A LED light is added to HKRAT-ZT02. Using a RFID reader (either handheld or fixed), operator can call a specific tag to light up the LED on it. This unique feature allows operators to locate a particular asset item from many items that look alike or exactly the same much easier and faster. Tamperproof sensor is another add-on feature which is especially suitable for security-focused applications. This sensor will be triggered if someone wants to remove the tag from the attached asset without permission. 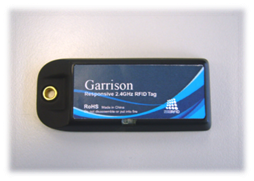 Long and adjustable reading distance to facilitate more flexibility yet stable performance in different applications could be implemented using our Empress series of active RFID readers and this GarrisonTM Responsive 2.4 GHz Active tag HKRAT-ZT02..Depending on the reader used, its reading range can be maximized to 50 meters. 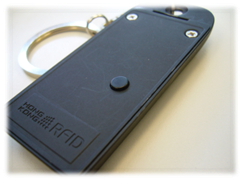 Operators are no longer restricted by the short reading distance of passive RFID products.